As promised, here is Part II, following from my last post on Sicily Part 1: Modica and those amazing scacce ragusane. So our journey continued through the south eastern side of Sicily with my husband’s delightful cousins Anna Maria and Salvatore. We drove to three additional cities showcasing their ancient beauty and intact Baroque style to include Siracusa and the island of Ortigia; my father in laws home town Palazzolo Acreide and ending our visit in Noto. Our base stay was in Syracusa not far from Ortigia Island. I had heard so much about this historic centre from my friend Rosa who runs yearly tours to Sicily, and has published her 2019 Culinary Tour of Sicily itinerary on her website so do check it out. This island also known in dialect as ‘u scogghiu’ – the rock, is a treasure. It is connected to Syracusa by its bridges and walking distance to its small but charming market. This market echoes the Arab influence with its alleys and aromas of various spices, colourful fresh and preserved local produce and enlivened by catchy phrases being shouted in Sicilian dialect. I was thrilled to see many Sicilian delicacies including cotognata and marmellata di fichi d'India. The hunks of tuna and sword fish were so fresh and spectacular to photograph and the seasonal fruit and vegetables were too good to pass by and not purchase. Here we also had our gluttonous stop at the Caseificio Borderi famous for its street food and for its ricotta cooked three times served hot with olive oil and garlic. Just next door is the amazing deli Fratelli Burgio where my husband found what he could not source here in Melbourne - a jar of minced sundried tomatoes, preserved in olive oil called cappuliato. Not as good as my mother in law would make but close enough to evoke wonderful memories of the dishes she would use this condiment in. Additional areas of interest are the impressive Cathedral of Syracusa whose structure includes Doric columns behind a reconstructed Baroque facade; and the church of Santa Lucia alla Badia, which houses the painting of Caravaggio, The Burial of Saint Lucy. We walked along the characteristic Via del Crocefisso, in the Giudecca district inhabited by the Jews until 1492; and did some subterranean exploration through the Ipogei di Piazza Duomo, a set of underground tunnels used during the Second World War as a refuge from bombing. Overlooking the sea is Fonte Aretusa, a fountain that originates in a fresh water spring and creates a small semicircular lake with fish, geese and ducks and where the plants of the only natural Papyrus (Papireto) in Europe grow luxuriantly. In Syracusa, the central Archaeological Park Neapolis is a must, comprising the Roman Amphitheatre, a Greek Theatre entirely carved into the rock, and the Ear of Dionysius – called this way for its ear shape and above all for its remarkable acoustic properties amplifying the sounds inside. Across the road from where we were staying we visited the Santuario della Madonna delle Lacrime built in memory of a miracle that occurred in 1953, the lacrimation of a plaster effigy of the Virgin Mary. 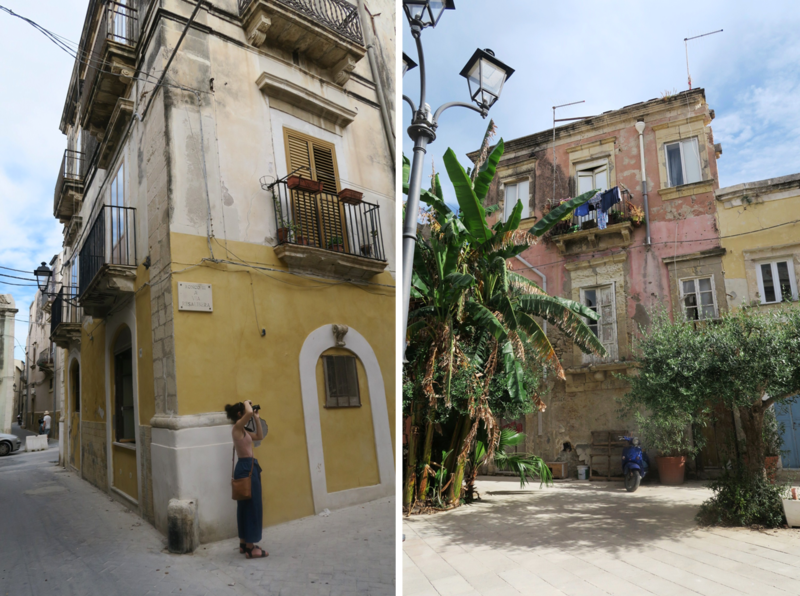 This town is often overlooked by tourist circuits, yet Palazzolo Acreide is well worth a visit. It is a UNESCO World Heritage town that boasts prized Baroque churches, palazzi and intricate facades. Less busy than Syracusa except when they celebrate their Saints. Although we just missed this religious event, on the 29 June the town celebrates the colourful Festa di San Paolo and ‘u giru ro pani’ - the tour and blessing of the bread. The statue of the patron saint comes out of the church in a blaze of fireworks, confetti and streamers, and paraded through the alleys of the historic centre and referred to as 'a sciuta' - the reveal. This is my father in laws hometown and where my husband’s last living aunt still resides. 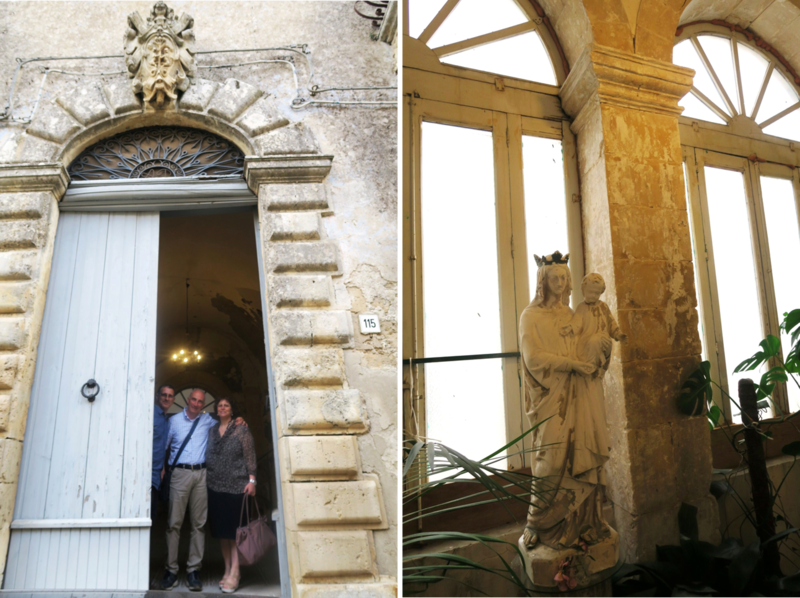 Reunited with zia Carmela was an emotional day and the privilege to visit her in her home - one of the towns oldest Baroque palazzo’s was a highlight. Located in via Garibaldi, its facade has different anthropomorphic and fantastic masks representing figures linked to the magical and mystical world and a labyrinth of rooms, all of which are slowly being meticulously restored. We were encouraged to take many photos with plans for the girls to paint and draw some artworks for the family and for me to document this family treasure. And of course the food of this town, one must not miss the obligatory stop at the Corsino pastry shop in via Nazionale, which since 1889 offers the best of Sicilian gastronomy from the classic arancini to the cannoli, as well as almond sweets. An unexpected culinary highlight for me however, was had at Ristorante La Trota a local salmon and trout farm established in the 1960’s just 7 km out of Palazzolo Acreide, whose restaurant was built in a natural grotto. Here our hosts chose a degustation of trout prepared eight different ways to include a trout ceviche with lemon sorbet. 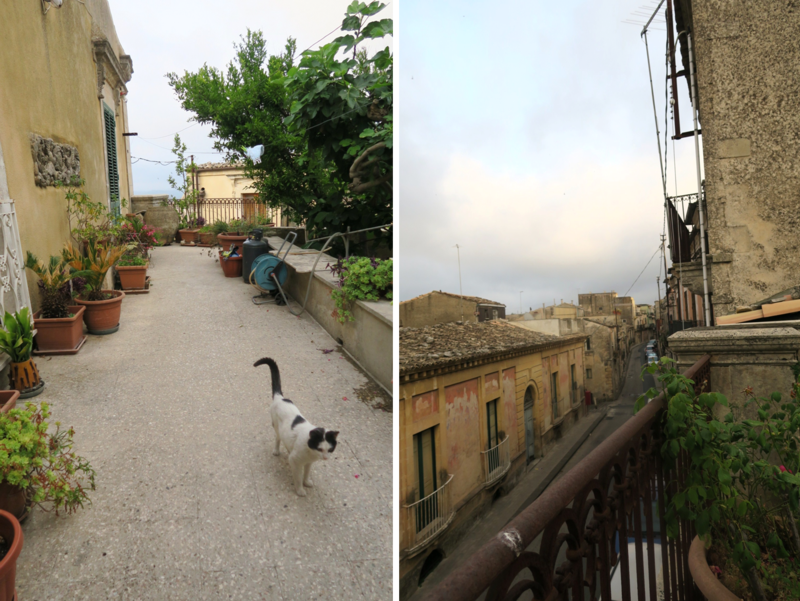 Our last day before flying out of Catania was spent in Noto. I will post about this city and its famous granita alla mandorla with recipe, at the end of the month as part of my contribution to our Cucina Conversations quarterly posts.